No configuration necessary due to "Plug-and-Play"
At any point where the process pressure has to be indicated locally, and, at the same time, a signal is wanted to be transmitted to a central controller or remote control room, the model PGT43HP intelliGAUGE (US Patent No. 8,030,990) can be used. 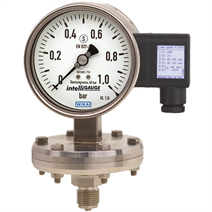 Due to the metallic construction of the pressure elements, these instruments have a high overpressure safety in the ranges of 40, 100 and 400 bar. Through the combination of a high-quality mechanical measuring system and precise electronic signal processing, the process pressure can be read securely, even if the power supply is lost. The intelliGAUGE model PGT43HP fulfils all safety-related requirements of the relevant standards and regulations for the on-site display of the operating pressure of pressure vessels. 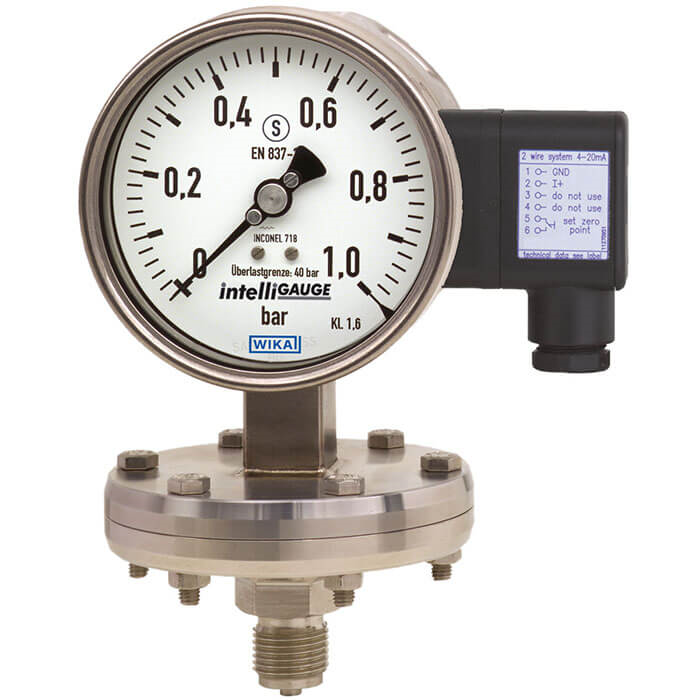 An additional measuring point for mechanical pressure display can thus be saved. The model PGT43HP is based upon a model 432.36 high-quality, stainless steel safety pressure gauge with a nominal size of 100 or 160. The pressure gauge is manufactured in accordance with EN 837-3. The rugged design of the diaphragm measuring system produces a pointer rotation proportional to the pressure. An electronic angle encoder, proven in safety-critical automotive applications, determines the position of the pointer shaft - it is a non-contact sensor and therefore completely free from wear and friction. From this, the electrical output signal proportional to the pressure, e.g. 4 ... 20 mA, is produced. The electronic WIKA transmitter, integrated into the high-quality pressure gauge, combines the advantages of electrical signal transmission with the advantages of a local mechanical display. The measuring span (electrical output signal) is adjusted automatically along with the mechanical display, i.e. the scale over the full display range corresponds to 4 ... 20 mA. The electrical zero point can also be set manually.